The Sharp-shinned Hawk is a small Accipiter (about the same size as an American Robin) that breeds in North America and Winters from North America and South into Central America. Photo is a juvenile male Sharp-shinned Hawk. Click for larger photo. 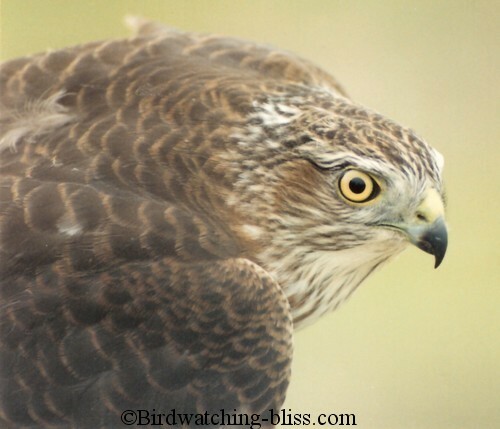 If you are trying to identify a hawk that may be a Sharp-shinned Hawk or a Cooper's Hawk, look at our Sharp-shinned Hawk vs. Cooper's Hawk page. The video below shows a juvenile Sharp-shinned Hawk perched. No doubt it was looking for small birds. The next video shows a Sharp-shinned Hawk flight using the typical Accipiter "flap-flap-glide" pattern. The last video shows an adult Sharp-shinned Hawk feeding. Several people have speculated if the bird is a sharp-shinned or Coooper's hawk. First, the bird is an adult because of the blue-gray upper parts vs. the brown back as seen in the previous video showing the juvenile. The adult also has the rufous (redish) horizontal bars on the breast as opposed to the heavy vertical brownish streaks seen on the juveniles. The bird in the video is a Sharp-shinned Hawk as opposed to a Cooper's Hawk for several reasons. First, there is almost no contrast between the back of the head and the back. There would be a light colored neck on a Cooper's Hawk. Second, the tail is more square across the end than very rounded as would be seen on a Cooper's Hawk. There are other advanced characters that can be seen like the size and shape of the eye and beak and the size of the legs (tarsi) and the relative length of the toes. Size can also be an aid in differentiating between sharpies and coops, but only if they are standing on or next to something you can use as a size reference. Sharpies are about the same size a an American Robin and Coops are about the same size as a crow. As noted in the Accipiters page, Sharp-shinned hawks are reverse size dimorphic, meaning that the females are larger than the males. Wheeler & Clark data are presumed to be primarily from Eastern birds (Cape May, NJ migration monitoring). We have some experience with both Eastern and Western Sharp-shinned Hawks. We have found that Western birds average slightly larger than Eastern birds. (This is opposite of what we found for Cooper's Hawks, where Eastern birds are larger). *Wing Chord is measured from from the wrist to the tip of the longest primary feather. The primary feathers have a natural camber (bend), and can be measured flattened or un-flattened. **Raptors store food in a crop (pouch in the throat area). Food in the crop or stomach can effect the birds weight. We can not know if there is food in the stomach, but we can estimate the amount of food in the crop. We score the crop on a 0= no food in the crop to a 3 = full crop. A full crop in a Sharp-shinned hawk could weigh as much as 30 grams. Keep in mind, we usually only capture raptors that are hungry, so only a few birds have crops and very few birds have large crops. Sharp-shinned Hawks prey almost exclusively on small - medium birds. They have very long toes with long spicules, which have evolved to help them hold onto the feathers of their prey. The largest prey item that I personally have seen taken by a Sharp-shinned Hawk was an American Robin (avg 77-81 g - taken by an adult male sharpie). The oldest known wild Sharp-shinned hawk lived to 19 Years and 11 months, based upon known age of a wild "sharpie" at banding and subsequent band recovery (Data from Bird Banding Lab (Klimkiewicz 2008).